A wife suspected her husband was sleeping with their maid,so she set a trap. She sent the maid to the village for weekend and didn’t tell her husband. 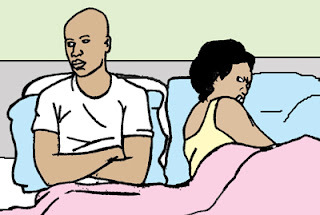 That night they went to bed.The husband woke up and gave his old story.”Excuse me dear,I want to watch TV in the parlour”, he went to the parlour first. Shortly,wife sneaked into the maid’s room,stripped and laid on the bed light off.She heard him coming in silently and wasted no time with words and started making love with her since she was unclad. When he finished,the wife said to him,”God has exposed you,you didn’t expect me on this bed,did you”? She then switched on the light.”No Madam !! !” said the gate man,I’m sorry,I didn’t know you were the one,just then,the husband opened the door !